Hundreds of Western Kentucky University students are being moved out of their residence hall because of mold. 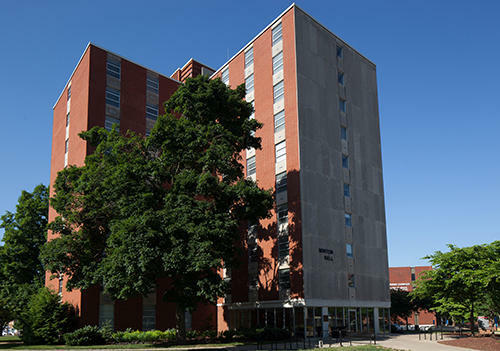 The school announced Wednesday night that the 348 students who live in Minton Hall will be relocated into other on-campus housing. WKU has been actively treating mold in Minton and three other residence halls this semester. The school hired a company to address the mold issues in Minton, but was not ultimately satisfied with the results. “That’s when we figured out that the configuration of that building was different, and it order to get the results that we really wanted for our students, we were going to have to move them out and do some other work, like removing the ceiling tiles,” said WKU spokesman Bob Skipper. The school decided the ceilings in Minton Hall have to be removed in order to treat the issues in that facility. Skipper said the school knows asking students to relocate this late into the semester is an inconvenience. Housing and Residence Life staff are helping Minton Hall residents relocate this week. Minton is closing Monday, Nov. 12, and is expected to reopen on January 18, 2019. Correction: An earlier version of this story said Minton was closing Nov. 5, but it is closing Nov. 12. Kentucky's newest medical school has opened its building in Bowling Green, a joint effort by Western Kentucky University, the University of Kentucky and Med Center Health. Western Kentucky has received a $1 million donation from former Hilltopper football player Joe Micatrotto and his wife Sunshine and school officials say it's the largest gift from an ex-student athlete.